The Beginner's coaching course is aimed at players who have little to no experience playing squash or any other racket sport. This course provides a stress-free, fun environment for players to learn the skills to help improve their game! The course runs in Terms 1 and 2 from Week 3 through to Week 10. If you join the beginner course but find that you belong in the Intermediate or even Experienced course speak to the coach and they will happily help you find which session is the best fit for you! "Having never played squash before, beginners coaching was extremely useful. It was in a fun and relaxed context which made learning pressure-free. I learnt basic technique, and how to move in a game, and overall it made me feel more comfortable on the court." The Intermediate coaching course is aimed at players who have some experience playing squash, or perhaps have played another racket sport to a good level. This course will allow you to really hone your technique and practice the basic shots as well as start preparing for match play. The Experienced Coaching course is aimed at players who have played squash to a reasonable level but who do not receive team and squad coaching. This course includes improving technique, movement and incorporates more complicated drills into the sessions. For someone who does not make the team/reserve squad in the October trials, this session provides the opportunity for them to improve and perhaps re-trial for the Squad in January. The experienced coaching course was useful, since I had never had any coaching before it allowed me to adjust my technique to the correct method. It also made me think about the shots I was playing, what shot I should play to increase my chances. Due to demand from our female members - this year (2018-19) we will be offering a Women's Only Session from 18:00-19:00 every Tuesday (beginning in Week 1, Term 1). This session provides women with the opportunity to come along and play in a relaxed environment and is open to players from beginner level all the way up to the teams. 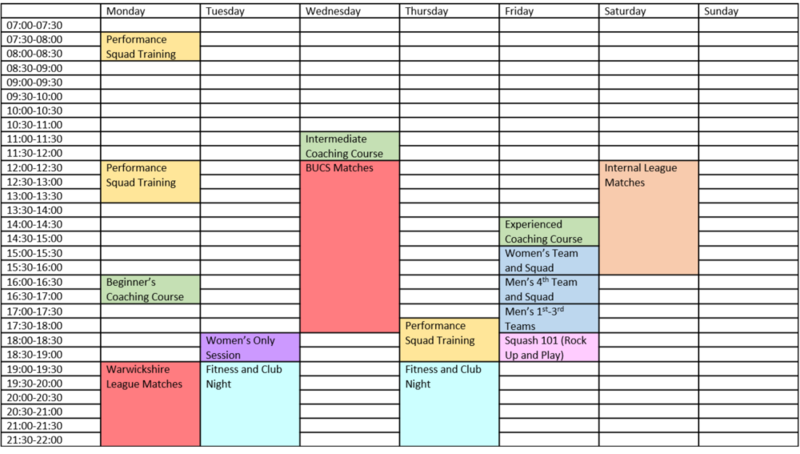 By incorporating the different levels of players there will be greater learning opportunities for less experienced players and provide a confidence boost for players who come to Club Nights and participate in our Leagues, Ladders and Tournaments.